If your grass has moss or a thatch of dead grass and leaves it can form a dense layer which holds water and creates an environment for moss to grow. It also stops water and oxygen getting to the grass roots below. Moss will make your lawn feel spongy and you can see it growing as a layer at the base of your grass. The way to get rid of this is with a simple scarify. Removing thatch is not only a good idea in autumn and spring but also essential if you need to overseed any areas. 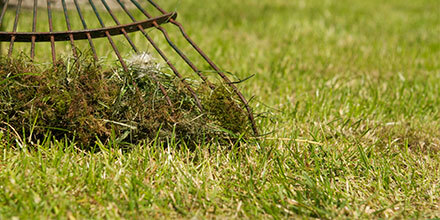 Use a leaf rake not an ordinary rake as this will rip lumps out of your grass rather than the moss. This is the simplest way although it involves an amount of physical effort to do the whole area. You should aim to rake in one direction then at slightly different angle to get more material. Remember though, grass will need help to recover from this. Sowing more seed or feeding is a good idea. You can hire or buy one if you have a large area to cover. This will remove a lot more material and will be useful if you want to overseed afterwards. This may result in seeing soil patches where the moss has been removed but that is what you need to overseed so don’t panic. Why do I get moss? Compacted or heavy soil that doesn’t drain well lets water sit and allows moss to thrive. Shady and damp areas under trees can be a consistent moss problem area.